"Come experience what makes skintuition different"
With a few simple questions, a single Dermograph Scientific Skin Scan, and my "intuition", I will customize a routine that will put you on the path to healthier, more beautiful skin. CONSULTATION FEE WILL BE WAIVED WITH PURCHASE OF PRODUCT OR SERVICE GREATER THAN $35. Cancer treatment can take a toll on the skin and Skintuition offers soothing skincare products and facials that will provide comfort and relief. Let's work together to rebalance and support "the new normal". A single Dermograph Scientific Skin Scan is included. CONSULTATION FEE MAY BE WAIVED WITH PURCHASE OF PRODUCT OR SERVICE GREATER THAN $35. Back acne can be frustrating! Now there is a treatment just for you. 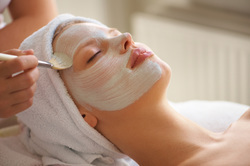 Includes cleansing, exfoliation, extractions if necessary, therapeutic LED light, treatment mask, and moisturizer. Can be done weekly. Improves skin tone, texture, and balance restoring a healthy refreshed glow using groundbreaking nanotechnology. RevitaPen allows for maximum absorption of targeted serums including the Osmosis Facial Infusion. If you have had microdermabrasion in the past and liked the results, you will love what RevitaPen will do for your skin! Note: Must be on Osmosis Vitamin A Serum for at least 4 weeks prior to treatment. Therapeutic LED light increases collagen and elastin production, reduces inflammation, speeds healing, increases circulation, and destroys acne bacteria. It is very soothing, relaxing, and gives any skin treatment a BOOST! Holistic method of exfoliation using a specialized tool to gently remove the outermost dead skin cells and fine, facial hair. Can be added to any facial treatment! EcoFin is a natural, petroleum-free alternative to traditional paraffin containing a rich blend of palm, soy, jojoba, organic coconut oils, plus shea butter, vitamin E, and essential oils moisturizing hands leaving them soft and supple. Formulated with seaweed extracts that provide a powerful hydrating effect, along with diverse active ingredients. There are several choices and one that meets the needs of every type of skin condition. Gentle, strip free method of waxing using hard wax. Enhance your natural beauty with specialized dye. Safe and non-toxic results lasting approximately 3 weeks. Are you looking for a holistic alternative to Botox and cosmetic fillers? This unique technology is not only painless, but a very relaxing facial treatment to rejuvenate your skin. It is a form of massage using very low levels of electrical current. It triggers the body’s natural cellular repair mechanism. Used as an anti-aging tool, it can diminish the appearance of fine lines and wrinkles by toning and rejuvenating the facial muscles. This process stimulates the production of collagen and elastin. The effects are immediate and cumulative. The uplifting therapy is preventative, as well as corrective. How many sessions will you need? The number of sessions depends on the patient’s age, ethnicity, skin condition and lifestyle. In most cases, a single treatment shows visible results. For long lasting results and muscle reeducation, weekly, bi-weekly or monthly maintenance sessions are recommended. How does the TAMA Blue Onyx help hyperpigmentation or melasma? Stimulation removes toxins from the cells and allows the body to heal itself. Who is not able to have TAMA Blue Onyx treatments? Those who are pregnant, actively have cancer, have electrical medical implants, or a seizure disorder. What Do Skintuition Clients Think? Wow, the set-up Mrs. Tracy has is very clean, professional, you can see how much effort she put into her business to make you feel at home. She is also very flexable when it comes to scheduling. Her product line to me is hands down the best for kids and adults. I brought my teen daughter here, she has never had a professional facial. Yes, I knew i had to call Tracy to the rescue. She has a small case of teen acne. Tracy takes the time to explain everything she is going to do and not only that, she asks what you use on your face, how many times do you wash your face, eating habits, ect. I also like that she asks you to bring in your products prior so she has an idea as well. She is not in the business to sell the products she uses, she genuinely wants to help you and if you want to continue with your own she is fine with that, no pressure. If you want to purchase the products she has, she will help you. However, I recommend you do, she knows her stuff and for me I think her products are better. I will be in myself to have a mommy facial I am truly excited and blessed to have found Mrs. Tracy. I suffer from hormonal acne, got to luv those BC pills, but I am 4 months off and feel so much better. Mrs Tracy is our GO TO LADY.. If you don't have acne no worries, she does all kinds of facials here, I am just giving you all what we did here, she is wonderful, professional, very passionate, friendly, just all around GREAT. If I could give her more stars I would. To my sisters out there YES, I am a witness and client. Thank you so much Mrs. Tracy for the special care you gave us today. MANY BLESSINGS. Tracy is absolutely amazing!! She takes the time to find out what your skin needs and does it without all the harsh chemicals! ​Always such a great experience. This week I had my first, but not last appointment with Tracy! The atmosphere was so warm and inviting and you could just feel good vibes in the air. Her personality is amazing and she made me feel extremely comfortable. She was very knowledgeable and her love for healthy skin shows. I can not wait for my next appointment. Tracy (the esthetician and owner of Skintuition) truly radiates great energy. And she brings her warm, positive energy into her beautiful treatment space to give clients exactly what their skin needs. Tracy is a wealth of knowledge, not only about skincare and skin health, but about overall health and wellness too. She is passionate about what she does and it shows. Her product line, Osmosis, is top of the line. These products are gentle, holistic and they work! No matter what your skincare concern it is absolutely worth a visit to Skintuition and Tracy. I love her!! Skintuition has a relaxing and peaceful atmosphere - very soothing. Tracy knows her stuff! I've been a client for several years and my skin just keeps getting better and better under her care and expertise. Osmosis are amazing products and she will help you find the right ones to use for just what you need to accomplish or maintain. TAMA Blue Onyx micro current is amazing, relaxing and reveals wonderful, subtle but noticeable results. The Rezenerate facial was even better than I even expected - the results of smooth, even toned skin and the ability for products to sink in further and do their job is priceless. In this ever changing skin care world, Tracy surrounds herself with the best and brightest Educators with high emphasis on Holistic Care and Natural ingredients and always seeks out higher education and learning, to bring her clients the best for their skin and well being. Skintuition is HIGHLY Recommended! I just had a facial here, tried the new Rezenerate Facial and it was amazing. My skin is practically glowing! Tracy the esthetician is very knowledgeable about skincare and products, she will steer you in the right direction for your personal skincare regimen. I liked the office space too, very calm and relaxing and so quiet! Unlike spas and Salons, it is definitely geared to induce relaxation! She's awesome. Knows her trade, and a fantastic honest person. Highly recommend!!!!! Had a fantastic experience at Skintuition today! The space is so inviting and peaceful and Tracy is a master at what she does. My skin looks and feels great after my treatment. Can't wait to try the new Osmosis products and hopefully get my skin in better condition. Loved the TAMA Blue Onyx treatment this am. Very happy to have found Tracy! Tracy is so amazing. This place is heaven for my skin !! Please schedule your appointment your face will thank you. I feel radiant, my skin is glowing, and I'm smiling from the inside out. The best thing about this place is the holostic approach. Tracy is very knowledgeable and she takes her time. I love this place. It's my newest addiction. 5 stars 2 thumbs up !! I'm feeling super blessed. Fantastic is the best word to describe Tracy, her skin treatments, and the products. As a regular client I am so happy with the condition of my skin. Tracy really listens to concerns and personalizes your treatments and product recommendations based on your skin type and lifestyle. I have been getting facials with Tracy for a few months now and I see a huge difference in my skin! After just one facial my skin looked healthier. I have been using the products Tracy recommended and each day has brought me more noticeable results. I am so grateful to Tracy Childs. She is very knowledgeable and experienced as an esthetician. I had been exposed to some toxins that caused my skin to have a serious breakout which caused a lot of scarring. Tracy knew just the right products and regimen for my personal needs. I can't thank her enough. I look forward to her cozy office and her warm smile when I have an appointment. I've had facials over the years though, none can even come close to the results I have had. Not to mention her positive attitude and the will to above and beyond to help. I appreciate her so much and am so grateful to her!! You will be amazed after scheduling with her!! I have had the pleasure of knowing a number of estheticians over the years. A handful are top-tiered and Tracy is of this caliber. I began seeing Tracy, at her old place in Ashburn, in the spring. I continue to see Tracy monthly and I am well pleased with my progress. Since the start of our relationship. Tracy has started her own practice in Manassas. What Tracy offers is a gold mine of services, products and knowledge. TAMA Blue Onyx is her specialty and Tracy is excellent. Needed an eyebrow wax before a job interview, called and was booked within hours of the call. Tracy was so polite and courteous. Best experience I have ever had in my 20 years of waxing. Highly recommend for the amount of time and detail that was given to me personally, I know she will treat any clients the same way! I'm looking forward to making an appointment for a facial when I have more money!! I won't go anywhere else now. I want to add to this review Tracy found out I had eczema and went over my entire skincare routine, on top of helping me with my eczema which is flaring really bad right now. My hands feel so much better already!! Thank you! !